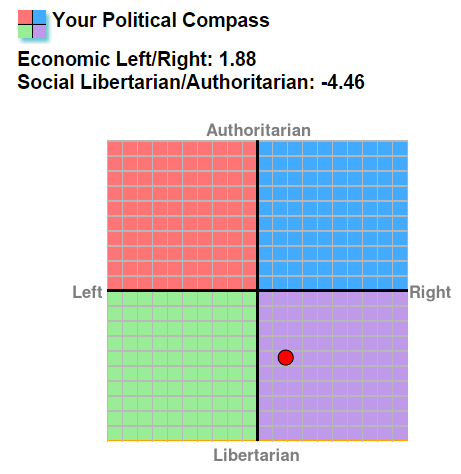 Ya know just a simple test, I've always considered myself a left leaning libertarian. Damn was i right. 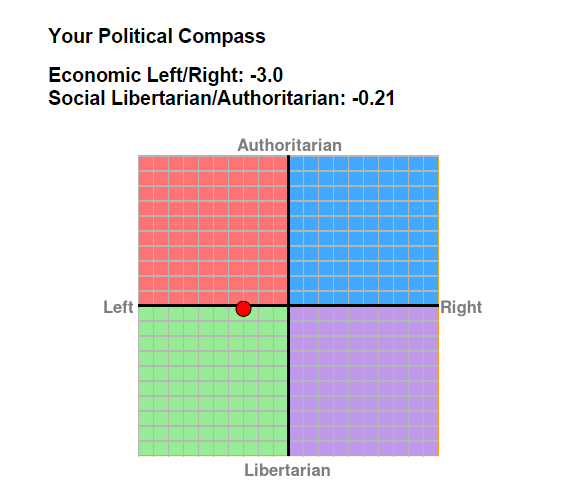 Post your results down below! Stop making me take tests Marker. My favorite color is green. 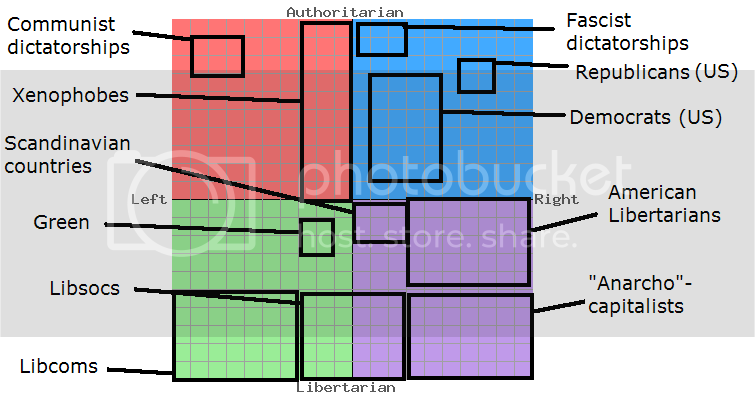 If I would have guessed, I wouldn't have been as far left economically. 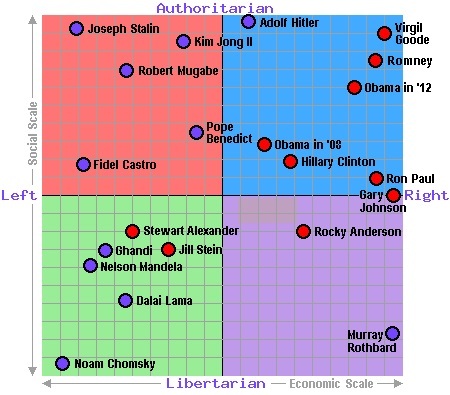 I love how I'm more fundamentally libertarian than mets. The premise of these questions are mostly illogical and detached from reality, therefore offering no correct/factual responses to many of them. The use of "sometimes" and terms such as "right and wrong", "justified", etc. are not uniformly defined by test-takers. What is "social responsibility", "the rich" or "contributing to society"? These cannot be defined with any sort of certainty. For example, the question: "Those with the ability to pay should have the right to higher standards of medical care", raises a number of problems. How did they acquire the ability? How much are they paying? What is a "standard of medical care", and how much higher is it than what it has been previously? While these questions cannot be answered, the real problem is the premise of the question and the insertion of "rights", as if that is something that too can be defined easily. If one man works hard, saves up his money, and decides to spend it on medical care, while another does the opposite and cannot afford it, is it morally wrong for the hardworking man to be able to afford medical care while the other does not? These questions are only touching the surface of the real issues, however. Should "taxpayers be expected to prop up any theatres or museums that cannot survive on a commercial basis"? If they choose to, certainly, but not by a bureaucratic edict from a non-local agency. 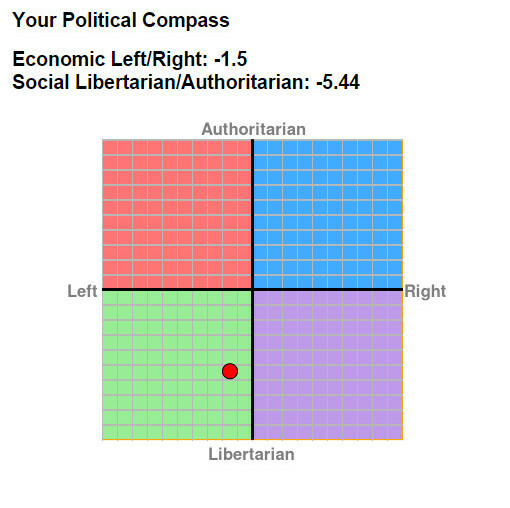 But if I click "agree", I will be moved more towards socialism, even though this position is derived from a classical liberal's viewpoint, and if I click "disagree", it will move me towards an anarchist/hard libertarian view, which is not the perspective I have whatsoever on the matter. But enough ranting. According to the test, which is of course incorrect, I seem to be exactly where Mets is on the graph. Yeah it's not a great test, just for providing a loose general indication of where one stands and for fun I suppose. Some of the questions make absolutely no sense at all like "Abstract art that doesn't represent anything shouldn't be considered art at all" lol.